Born in Seoul, South Korea, to a Korean mother and African-American father, Ward grew up in the Atlanta area. He has become an advocate for the social acceptance of foreigners in Korea, especially blended or mixed race youth. Aside from his career in the NFL, Ward has appeared in various forms of film and television media, including the reality TV series Dancing With The Stars and brief cameos in the 2012 film The Dark Knight Rises and in the television series The Walking Dead. He was a studio analyst for NBC's Football Night in America from 2012 to 2015. Ward joined CNN and HLN in May 2016. He is the Player Relations Executive of the Alliance of American Football. Ward was born in Seoul, South Korea, to a Korean mother, Kim Younghee (Hangul: 김영희) and African-American father, Hines Ward Sr. His family moved to Atlanta and East Point, Georgia, when Hines Jr. was one year old and Hines Sr. went to Germany to serve a tour of duty. The next year, Ward's parents divorced, with Ward living with his mother and then with his paternal grandmother after Hines Sr. pleaded in family court that Kim could not easily raise Hines Jr. independently as she did not speak English sufficiently. At the age of 7 Ward was reunited with his mother. For reasons not disclosed to the public, during this time, Hines Ward Sr. did not support Ward with child support or visit him regularly. Ward has stated that he talks with his father about once every two years. Ward has stated that he has yet to reconcile with his father who left Hines Jr. when he was two years old. Under the guidance of coach Mike Parris at Forest Park High School in Forest Park, Georgia, Ward showcased his athletic skills as a quarterback and was two-time Clayton County Offensive Player of the Year. He also excelled in baseball and was selected by the Florida Marlins in the 73rd round (1,646th overall) of the 1994 MLB Draft. As a wide receiver for the University of Georgia Bulldogs (1994–1997), Ward's 149 career receptions for 1,965 yards placed him second in team history. He also played tailback and totaled 3,870 all-purpose yards, second only to Herschel Walker in Bulldogs history. In 1996, Ward had 52 receptions for 900 yards, and also ran 26 times for 170 yards. In 1997, he hauled in 55 passes for 715 yards and scored six touchdowns while, and also ran 30 times for 223 yards, getting All-SEC honors in the process. Ward played some quarterback his sophomore year, and holds Georgia bowl game records for pass attempts, pass completions, and passing yards in the 1995 Peach Bowl in which he completed 31 of 59 passes for 413 yards. When he came out of college, it was discovered that Ward was missing an anterior cruciate ligament (ACL) in his left knee, which he lost during a bicycle accident during childhood. According to a Yahoo! Sports article, Ward broke his kneecap in the fourth grade and the doctors never accounted for the ligament. Coming out of the University of Georgia, Ward was regarded as one of the top five receivers in the 1998 NFL Draft, along with Kevin Dyson and Randy Moss. He was projected to be selected at the end of the first round or beginning of the second. The Tampa Bay Buccaneers and Indianapolis Colts expressed major interest in him, visiting him multiple times to meet with him. After it was discovered Ward did not have an ACL in one of his legs, his value dropped. The Buccaneers chose to draft Jacquez Green (32nd overall) and the Colts Jerome Pathon (34th overall) instead, both wide receivers. Ward was selected by the Pittsburgh Steelers in the third round (92nd overall) of the 1998 NFL Draft. On July 20, 1998, the Steelers signed him to a three-year, $885,000 contract. Ward began his rookie season as the fourth receiver on the Steelers' depth chart. He played in his first career game on September 6, 1998, against the Baltimore Ravens, catching a 12-yard pass from Kordell Stewart. During a Week 10 contest against the Green Bay Packers, he caught a season-high 2 passes for 56-yards. Although he appeared in every game during his first season, he finished with only 15 receptions for 246 receiving yards. In 1999, he saw more action after former starting wide receiver Charles Johnson departed for Philadelphia during the off-season. He began the season as the starting wide receiver in the season opener against the Cleveland Browns. Ward caught his first career touchdown from Mike Tomczak and finished the game with a total of 3 catches for 51-yards. On October 10, 1999, he had 6 receptions for 67 receiving yards, and caught a touchdown from Kordell Stewart. In Week 12, he accounted for a season-high 7 receptions and 89 receiving yards, and caught a 34-yard touchdown in a 20–27 loss to the Cincinnati Bengals. During the first quarter of a Week 14 matchup against the Ravens, Ward caught a 21-yard touchdown pass from Jerome Bettis. Ward finished his second season with 61 catches, 638 receiving yards, and 7 touchdowns in 16 games and 14 starts. He began his third season with Pittsburgh, making 2 receptions for 20 yards in the Steelers' home opener against the Baltimore Ravens. On September 17, 2000, he received his first start of the season at the Browns and had 5 receptions for 75 receiving yards. In a Week 7 win over Cincinnati, he accumulated a season-high 91 receiving yards on 2 catches, while scoring a 77-yard touchdown, his first of the season. On December 10, 2000, he caught a season-high 6 passes for 64 receiving yards in a 10-30 loss at the New York Giants. In his last season under offensive coordinator Kevin Gilbride, Ward finished with a total of 48 receptions for 672-yards and 4 touchdowns. On September 8, 2001, Ward was signed to a four-year, $9.5 million contract extension. In his first year under new offensive coordinator Mike Mularkey, Ward had his best season of his career to that point. While starting in the season opener at Jacksonville, he made 7 catches for 82 receiving yards. In their second game against the Jaguars in Week 10, Ward came away with 9 receptions for 112-yards and scored a 28-yard touchdown in a 20-7 victory. This also marked his first game with over 100 receiving yards in his career. On December 9, 2001 against the New York Jets, Ward accumulated a season-high 10 catches for 124 receiving yards. He played in his first playoff game of his career in 2001, making 3 receptions for 37-yards in a 27-10 divisional win over the Ravens. The next week, as the Steelers played the New England Patriots, he caught 6 passes for 64 receiving yards in a 17-24 loss to the eventual Super Bowl XXXVI Champions. 2001 marked his first season with 16 starts and over 1,000 receiving yards, as he finished with 94 catches for 1,003 receiving yards and 4 touchdown catches. Along with Jerome Bettis, Kordell Stewart, Alan Faneca, Jason Gildon, and Kendrell Bell, he was voted to the 2001 Pro Bowl, making it the first of his career. During the 2002 season opener, he had eight catches for 90 yards and a touchdown, in an AFC Championship rematch against the Patriots. The next game, he caught 7 passes for 92 receiving yards and 2 touchdowns in a 17–30 loss to the Oakland Raiders. It was his first game with more than a single touchdown in his career. During a Week 5 matchup at New Orleans, Ward made 5 receptions for 45-yards and caught his first touchdown reception from new quarterback Tommy Maddox. On November 10, 2002, Ward had his best game of the season, making a season-high 11 receptions, 139 receiving yards, and a touchdown during a 34-34 tie with the Atlanta Falcons. The following week, he caught 10 passes for a season-high 168 receiving yards and caught 2 touchdowns in a 23-31 loss to the Titans. It was his third game of the season with 2 touchdown receptions. He continued to dominate the next game against the Bengals, as he had 125-yards on 10 receptions, while also scoring a 64-yard touchdown during the 29-21 victory. This was Ward's third consecutive game with over 100 receiving yards and a touchdown. The Steelers finished the season 10-5-1 and made the playoffs for the second year in a row. On January 5, 2003, they played the Browns in the AFC Wild-card game. Ward finished the game with 11 catches, 104 receiving yards, and also caught his first career postseason touchdown in the 36-33 victory. The following week, the Steelers played at Tennessee for in the divisional playoff game. Although they lost 31-34, Ward finished with 7 catches for 82 receiving yards and 2 touchdowns. Along with teammate Alan Faneca, Ward was selected to play in his second consecutive Pro Bowl. In the Pro Bowl, he caught 2 passes for 45-yards and scored a 32-yard touchdown. He finished his fifth season with 1,329 receiving yards, 112 receptions, and 12 touchdown receptions, all career-highs. This also was his only season with over 100 receptions. After having the best season of his career, Ward returned in 2003 to make 9 catches for 91 receiving yards and 2 touchdowns in the season opening win over the Ravens. The following game, he caught another 9 passes for 146-yards in a 20-41 loss at the Kansas City Chiefs. On November 30, 2003, Ward caught a career-high 13 passes for 149 receiving yards and a touchdown in a loss to the Bengals. In 2003, the Steelers voted him their team MVP as he caught a total of 95 receptions for 1,163 yards and 10 touchdowns for the season. He was voted, along with Faneca, to his third consecutive Pro Bowl. After three successful years with Mike Mularkey, Ward began the season under new offensive coordinator Ken Whisenhunt and new wide receivers coach Bruce Arians. On September 19, 2004, he caught 6 passes for 151 receiving yards and a touchdown in a 13-30 loss at Baltimore. During the 4th quarter starting quarterback Tommy Maddox was injured and replaced by rookie quarterback Ben Roethlisberger. After replacing Maddox, Roethlisberger threw a touchdown pass to Ward, making it the first one of their career together. During a Week 3 contest at the Miami Dolphins, Ward caught 9 passes for 96 yards and a touchdown. After replacing Maddox, Roethlisberger led the Steelers to 14 wins in a row. On December 18, 2004, Ward made 9 catches for a season-high 134 yards as Pittsburgh beat the Giants 33-30 for their 13th consecutive victory. After finishing the season 15-1, the Steelers played the Jets for the divisional championship. During the 20-17 win, Ward racked up 10 catches for 105 receiving yards and a touchdown. On January 23, 2005, the Steelers lost 27-41 to the eventual Super Bowl XXXIX Champions, the New England Patriots. In the AFC Championship game, Ward pulled in 5 catches for 109-yards and a touchdown. For the fourth year in a row, he was voted to the Pro bowl along with Alan Faneca. In the game, he had 63 receiving yards on 3 receptions and scored a touchdown. He finished the season with catching 80 passes for 1,004 receiving yards and 4 touchdowns. This also marked his third year with over 1,000 receiving yards. In 2005, Ward missed the first two weeks of training camp in a holdout for a contract extension that would increase his salary. Ward had considered holding out before camp in 2004, but had been persuaded after meeting with the Steelers' owner Dan Rooney and Jerome Bettis. He was told they could work out an extension during the year and he'd be paid fairly. With a great relationship with Dan Rooney, he conceded and eventually showed up on August 15, 2005 on the sidelines for Pittsburgh's first preseason game against the Philadelphia Eagles. That night, though, he did not play in that game. On September 5, 2005, the Steelers announced that they had reached an agreement on a four-year contract extension worth $25.83 million with Ward. On September 18, 2005, he caught 6 passes for 84 receiving yards and 2 touchdowns in a 27-7 victory over the Texans. The next week, Ward had 4 catches for 110 receiving yards and 2 touchdowns, including an 85-yard touchdown reception, against the Patriots. Although they lost to the defending Super Bowl Champions 20–23, this marked Ward's first back-to-back games with 2 touchdown receptions. After starting 88 consecutive games, Ward missed the game against the Jaguars on October 16. Immediately following Super Bowl XL, Ward was videotaped for the "I'm Going to Disney World!" television commercial, adding "...and I'm taking The Bus!" Ward and Steelers teammate Jerome "The Bus" Bettis appeared in a victory parade at the Magic Kingdom theme park on February 6 along with Emmitt Smith. After 2005, he returned to start in the Steelers' season opener against the Dolphins and caught 5 passes for 53 yards and a touchdown, as they beat Miami, 28–16. On October 22, 2006, Ward caught 8 receptions for 171 receiving yards and caught 3 touchdowns for the first time in his career, as they lost 38–41 to the Atlanta Falcons. During the season, he missed Weeks 13 and 14 and only finished his second season in a row with exactly 975 receiving yards. After the Steelers finished 8–8 and missed the playoff, Head Coach Bill Cowher announced he was retiring. After eight years under Bill Cowher, Ward had the second coach of his career, as the Steelers organization hired Minnesota Vikings defensive coordinator Mike Tomlin as their new head coach. This also marked his first season under offensive coordinator Bruce Arians, as Ken Whisenhunt left to become the Arizona Cardinals head coach. As the Steelers played the Bengals on October 28, 2007, Ward hauled in 8 passes for 88-yards and 2 touchdowns. On December 2, 2007, he caught a season-high 11 passes for 90 receiving yards and 2 touchdown receptions during the 24-10 victory over the Bengals. The 2 touchdowns against the Bengals made Ward the Steelers' all-time touchdown receptions leader with his 64th touchdown reception. Then on December 20, 2007, Ward became the Steelers' all-time receiving yardage leader in a game against the St. Louis Rams. In his first year under Mike Tomlin, the Steelers finished 10-6 and made the playoffs. Although they lost the AFC Wild Card game 29-31 to Jacksonville, Ward made 10 receptions for 135 receiving yards. Ward finished his ninth season with 71 receptions, 732 receiving yards, and 7 touchdowns. During the season, he missed Weeks 4, 5, and 17, making it the most games he missed in a single season. Ward began the 2008 NFL season with 6 receptions, 76 receiving yards, and 2 touchdown catches in a 38-16 victory over the Texans. On November 16, 2008, he caught a season-high 11 passes for 124-yards against the San Diego Chargers. During a Week 16 contest at the Tennessee Titans, Ward racked up a total of 7 receptions for 109 receiving yards and scored a touchdown as the Steelers lost 14-31. The next week on December 28, 2008, Ward caught his 800th NFL reception, extending his record for receptions by a Steelers receiver. Also in this game, Ward achieved his first 1000-yard season since 2004, finishing with 81 receptions for 1043 yards and 7 touchdowns on the year. The Steelers finished the 2008 regular season with a 12–4 record and made the playoffs. During the AFC divisional game against the San Diego Chargers, Ward caught 4 passes for 70 yards. The following week in the AFC Championship, he made 3 receptions for 55 yards as they beat the Ravens 23-14 to go on to Super Bowl XLIII. On February 1, 2009, the Steelers played the Arizona Cardinals, led by the Steelers' former offensive coordinator Ken Whisenhunt. During the game, Ward played a supporting role behind Santonio Holmes but made 2 receptions for 43 yards, as the Steelers won 27-23 on a last-minute touchdown reception by Holmes. He played the game with a sprained right MCL. Ward completed the season with 81 receptions, 1,043 receiving yards, and 7 touchdown receptions. On April 25, 2009, the Steelers signed Ward to a four-year, $22 million extension with a signing bonus of $3 million. In the Steelers' home opener, he had 8 catches for 103 receiving yards. On September 27, 2009, during a game against Cincinnati, Ward's four catches for 82 yards earned him 10,000 career receiving yards and made him the first wide receiver in Steelers' history to achieve that milestone. On third-and-two Ben Roethlisberger hit Ward for a 14-yard gain, giving Ward 10,001 career receiving yards. During a Week 6 contest against the Browns, Ward accumulated 8 receptions, 159 receiving yards, and a touchdown. The game marked his third game of the season with over 100 receiving yards. He had his third game with over a hundred yards on November 22, as he had a season-high 10 catches for 128-yards and a touchdown against the Kansas City Chiefs. On December 20, 2009, Ward caught 7 passes for 126 receiving yards in a 37-36 victory over the Green Bay Packers. This was the first time Ward had 5 games with over 100 receiving yards in a single season. Ward finished the 2009 season with 95 receptions for 1,167 yards and 6 touchdowns as the Steelers finished 9–7. After the Steelers drafted Mike Wallace in 2009 and Emmanuel Sanders and Antonio Brown in 2010, Ward began to have a decline in his receptions. In the 2010 home opener against the Falcons, Ward caught 6 passes for 108 receiving yards as the Steelers won 15-9. In the game against the Atlanta Falcons, Ward became the first player in Steelers history to surpass 11,000 receiving yards. He caught 108 yards worth of passes in that game to pass Hall of Fame Steelers receiver John Stallworth for the most 100-yard receiving games all-time for the Steelers with his 26th. His 6 catches against the Falcons gave him 901 for his career, making him only the 12th NFL player of all time to surpass 900 career receptions. On October 24, 2010, he had a season-high 131 receiving yards on 7 receptions and scored a touchdown against the Miami Dolphins. In Week 14 against the Bengals, he hauled in a season-high 8 passes for 115-yards. Ward's streak of 186 consecutive games with at least one reception came to an end in a 39-26 loss against the New England Patriots in Week 10 of the 2010 season. A short catch by Ward was knocked loose when he was tackled by safeties Patrick Chung and James Sanders, and was knocked out of the rest of the game; the Patriots challenged the call, and the pass was ruled incomplete on review, ending the streak. On January 15, 2011, the Steelers played the Baltimore Ravens in the divisional playoffs. Ward finished the contest with 3 receptions for 25 yards and a touchdown, as the Steelers won 31-24. The next week in the AFC Championship, he had 2 catches for 14 yards as the Steelers beat the New York Jets 24-19 to advance to Super Bowl XLV. On February 6, 2011, Ward appeared in his third Super Bowl with the Steelers against the Green Bay Packers. In his first career Super Bowl loss, he caught 7 passes for 78 receiving yards and a touchdown. He finished the 2010 season with 59 receptions, 755 receiving yards, and 5 receiving touchdowns. He had not had a season below 60 catches since 2000. Ward began the 2011 NFL season, making 5 receptions for 67-yards in the Steelers' season opener against the Ravens. On October 9, 2011, he had 7 catches for 54 receiving yards and 2 touchdown reception. In this game, he caught the last touchdown of his career on an 8-yard touchdown pass from Ben Roethlisberger in the second quarter. On December 4, 2011, in a 35–7 home victory against the Cincinnati Bengals, Ward became the 19th player in NFL history to reach 12,000 receiving yards. On January 1, 2012, in a game against the Cleveland Browns, Ward caught his 1000th reception, becoming the eighth player in NFL history to do so. He also caught his last career reception during the game. He appeared in his last game with the Steelers on January 8, 2012, as the Steelers lost 23–29 to the Denver Broncos in the AFC Wildcard Game. He finished his last season with a total of 46 receptions, 381 receiving yards, and only 2 touchdowns in 15 games and 9 starts. On March 07, 2012, the Steelers announced their intention to cut and release Ward, which they did two days later. On March 20, 2012, Ward announced his retirement from professional football stating, "Without the support over the past 14 years this game wouldn't be the same to me. It wouldn't be as fun for me. You guys meant the world to me. The city and this organization means the world to me. So today as sadly as it feels for me right now, I hope it will be a good day for everyone here." At the time of his retirement, Ward was the last remaining player from the Steelers to have played with the team during the 1990s. In addition, he was also their last player to have played for them in Three Rivers Stadium. Ward accumulated 76 receptions, 1,064 yards, and eight receiving touchdowns in 14 post-season appearances. Although the Steelers have not officially retired Ward's #86, they have not reissued it since his retirement and it is understood that no Steeler will ever wear it again. Ward's versatility, hands, and willingness to block served him well as a professional wide receiver. Since being drafted by the Steelers in the third round of the 1998 NFL Draft, he earned three team Most Valuable Player (MVP) selections. He was also a four-time NFL Pro Bowl selection (2001–2004). Ward also had a streak of 4 consecutive 1,000 yard seasons. The streak was broken in the 2005 NFL season during which he missed a game due to injury. In 2002, he set a Steelers franchise record for receptions (112) and touchdowns (12) (both since broken by Antonio Brown) and was named to his first of two consecutive All-NFL teams. Although he was considered one of the best blocking receivers in the NFL, Ward often faced criticism for his style of blocking, particularly for his propensity to hit defenders on their blind-side. During a game on October 19, 2008, Ward put a vicious downfield blindside block on rookie Cincinnati Bengals linebacker Keith Rivers. The impact of the block left Rivers with a broken jaw, and caused him to miss the remainder of the 2008 season. Ward was not penalized for this block, nor was he fined by the league as the hit was deemed legal. The league, however, later passed a new rule banning such hits. The so-called "Hines Ward Rule" made a blindside block illegal if the block came from the blocker's helmet, forearm or shoulder and lands to the head or neck area of a defender. In a Sports Illustrated poll of NFL players in 2009, he was voted the "dirtiest player in the NFL." Ward resides in Sandy Springs, Georgia, with wife Lindsey Georgalas-Ward and has a son named Jaden from his first marriage. On his upper right arm he has a tattoo of Mickey Mouse  in the Heisman pose, just below a tattoo of his name in Korean. Ward co-owned a bar in Pittsburgh's South Side called The Locker Room. The bar sustained serious water damage in February 2007, due to flooding from a malfunctioning boiler, and it was closed for repairs until June of that year. The bar received an insurance settlement of $500,000, which subsequently became an issue during a legal dispute between the bar's owners. On September 11, 2007, co-owner Nicholas Lettieri withdrew the entirety of the bar's funds, approximately $19,000, from a corporate account, causing it to miss a large number of scheduled payments. The company filed suit for the return of the money, and Lettieri subsequently justified his actions by claiming that the money was owed to him, also voicing the belief that the other co-owners, Ward and Kimberly Pitts, as well as Pitts' husband, Korry Pitts, had falsified invoices and diverted company funds to their own bank accounts. Company attorney Thomas Castello dismissed Lettieri's allegations as "baseless, ridiculous and unfounded," and the matter currently is before the court. The Locker Room reopened under the name South Side 86 (because of Ward's jersey number), and is owned entirely by Ward, who bought out his co owners. Ward hosted the Hines Ward Show on Pittsburgh CBS O&O KDKA-TV from 2006-2012. In 2012, shortly after announcing his retirement, it was announced that Ward had signed on with NBC Sports to be a football analyst, highlighted by his role on the Sunday Night Football pregame show Football Night in America. He opened a restaurant called Table 86 and wine bar named Vines in Seven Fields with Howard Shiller in August 2015. Ward joined CNN and HLN in May 2016. He is a current CNN studio analyst. In 2018, he joined the Alliance of American Football as the Player Relations Executive. In 2006, Ward became the first Korean American to win the Super Bowl MVP award. This achievement threw him into the spotlight of media in South Korea. From April 3 through May 30, 2006, Ward returned to his birthplace of Seoul for the first time since his parents moved to the United States when he was one year old. Ward used his celebrity status to arrange "hope-sharing" meetings with multiracial Korean children and to encourage social and political reform. At one hope-sharing meeting, he told a group of children, "If the country can accept me for who I am and accept me for being a Korean, I'm pretty sure that this country can change and accept you for who you are." On his final day in Korea, he donated $1 million USD to create the Hines Ward Helping Hands Foundation, which the AP called "a foundation to help mixed-race children like himself in South Korea, where they have suffered discrimination." In September 2010, President Barack Obama appointed Ward as a member of the President's Advisory Commission on Asian Americans and Pacific Islanders. On July 9, 2011, Ward was arrested for driving under the influence in DeKalb County, Georgia, after being witnessed by a MARTA police officer failing to maintain his lane and subsequently hitting a curb. An officer of the DeKalb County Police Department responded which led to the investigation and Ward's arrest. On February 22, 2012, the DUI charge was dropped as part of a plea agreement. Ward agreed to plead guilty to reckless driving and received a sentence of one year of probation, 80 hours of community service and a $2,000 fine. Ward made an appearance as a member of the fictional Gotham Rogues football team in the 2012 film The Dark Knight Rises, and was one of the members of "Team Rachael" in the second season of Food Network's Rachael vs. Guy: Celebrity Cook-Off. He appeared in the 9th episode of the third season of The Walking Dead, appearing as a walker. On May 24, 2011, Ward and his partner Kym Johnson won season 12 of the American TV dance competition Dancing with the Stars. 7 Team Cha-Cha-Cha/ "We R Who We R"
Semi-finals Argentine Tango/ "Perhaps, Perhaps, Perhaps"
Finals Quickstep/"Puttin' On The Ritz"
Freestyle/"Dancing Machine" and "I Want You Back"
* In week 7, Donnie Burns was the guest judge and scored the dances as well (first score listed is Burns'). In 2012, Ward began training for the 2013 Ironman World Championships, enlisting the help of triathlon legend Paula Newby-Fraser. On June 9, 2013, he competed in the Ironman Kansas 70.3. His finish time was 5:53:18, which earned him the overall rank of 623. On October 12, 2013, Ward completed the Ironman World Championships. He finished with a time of 13:08:15. Upon completion, he told Mike Florio at NBC that he will "never" compete in another triathlon and that he was "one and done". In August 2017, Ward worked with the Steelers' receivers as a coaching intern. Ward was named as an honorary ambassador for the 2018 Winter Olympics in Pyeongchang. ^ Branch, John, "Ward Helps Biracial Youths on Journey Toward Acceptance", The New York Times, Monday, November 9, 2009. ^ Greenfeld, Karl (May 15, 2006). "The Long Way Home". Sports Illustrated. Archived from the original on April 9, 2010. ^ Corbett, Jeff, "Ward eager to win Super Bowl XL for 'Bus' and mom", USA Today, February 1, 2006. ^ Jim Corbett (February 8, 2006). "Ward takes place among Steelers' legends". USA Today Sports Weekly. ^ Ed Bouchette (October 4, 2007). "Steelers Notebook : Holmgren puts Super Bowl in past". Pittsburgh Post-Gazette. ^ "sports.yahoo.com - Ward still plays with chip on his shoulder - Feb 1, 2010". Yahoo!. Retrieved February 1, 2010. ^ Taresa Varley. "Draft Day Memories:Hines Ward". Retrieved May 4, 2014. ^ sportrac.com. "Hines Ward contract". Retrieved December 28, 2015. ^ NFL.com. "NFL/Player/Hines Ward/Career stats". Retrieved December 28, 2015. ^ "Steelers sign receiver Ward to 4-year, $25.83M deal". September 5, 2005. Retrieved August 27, 2009. ^ Ed Bouchette (December 3, 2007). "Hines' field ... Steelers put best footing forward in win". Pittsburgh Post-Gazette. ^ Bouchette, Ed (December 29, 2008). "Steelers Notebook: Pass-happy Hines Ward makes his 800th catch". Pittsburgh Post-Gazette. Holiday pay. Retrieved December 29, 2008. ^ John Clayton (April 25, 2009). "Source: Ward signs through 2013". ESPN.com. ^ "The Official Site of the Pittsburgh Steelers". Archived from the original on October 3, 2009. ^ NFL.com. "NFL Player Profile:Hines Ward". Retrieved December 28, 2015. ^ "Hines Ward Reaches Receiving Milestone in Victory Over Bengals". ^ Graves, Will (February 29, 2012). "Steelers will release WR Hines Ward". The Boston Globe. Associated Press. Retrieved March 1, 2012. ^ Bouchette, Ed (March 7, 2012). "Ward, Farrior, Smith, Kemoeatu officially ex-Steelers". Pittsburgh Post-Gazette. Retrieved March 7, 2012. ^ "Hines Ward retires as Pittsburgh Steeler". March 20, 2012. Archived from the original on March 22, 2012. Retrieved March 20, 2012. ^ "Ward announces retirement after 14 seasons with Steelers". NFL.com. March 20, 2012. Retrieved March 20, 2012. ^ "Replay review, draft order among changes made by owners". March 25, 2009. Retrieved March 26, 2009. ^ "Hines Ward Stats". ESPN. ESPN Internet Ventures. Retrieved June 24, 2014. ^ "Hines Ward 2.0". Retrieved May 4, 2010. ^ "SI.com - NFL Body Art - Jan 10, 2006". CNN. Archived from the original on January 13, 2006. Retrieved May 4, 2010. ^ Karen Roebuck (January 12, 2006). "Hines Ward has another Locker Room". The Pittsburgh Tribune-Review. Archived from the original on February 28, 2007. ^ a b c d e Bobby Kerlik (September 19, 2007). "Steelers' Ward, associate accused of taking money". The Pittsburgh Tribune-Review. Archived from the original on November 9, 2007. ^ CBS Broadcasting Inc (press release) (September 13, 2006). "Hines Ward Tapes First Show". KDKA-TV. Archived from the original on September 27, 2007. ^ EndPlay (May 31, 2012). "Hines Ward joins NBC's "Sunday Night Football" team". ^ Wills, Rick. "Hines Ward to open Table 86 restaurant in Seven Fields". TribLIVE.com. ^ Hines Ward [@mvp86hinesward] (May 25, 2016). "I'm excited to be a part of the media world's leader in @cnn @HLNTV It's a big honor for me and I am truly grateful for the opportunity" (Tweet) – via Twitter. ^ "CNN Profiles - Hines Ward - Sports Contributor - CNN". CNN. ^ Benjamin, Cody. "Hines Ward: New AAF league negotiating with 'big names,' wants to complement NFL". CBSSports.com. Retrieved September 18, 2018. ^ a b Chuck Finder (April 9, 2006). "Hines Ward scores big for social change". Pittsburgh Post-Gazette. Archived from the original on April 11, 2006. ^ "Ward kicks off his new charity". Pittsburgh Post-Gazette. Associated Press. May 30, 2006. ^ White House Press Secretary (September 16, 2010). "President Obama Announces More Key Administration Posts". White House. ^ Limprahanonta, Paul. "NFL Player Hines Ward Arrested for DUI". Crime Blitz News. Archived from the original on July 12, 2011. Retrieved July 9, 2011. ^ Garner, Marcus K. (February 22, 2012). "Hines Ward's DUI charges dropped; pleads guilty to reckless driving". The Atlanta Journal-Constitution. Retrieved March 2, 2012. ^ "Batman Trailer: Hines Ward, Heinz Field In Preview Of 'The Dark Knight Rises' (VIDEO)". The Huffington Post. December 20, 2011. ^ "Hines Ward gets Zombified for The Walking Dead". People Magazine. February 11, 2013. ^ "'Long way from the football field'". ESPN. April 1, 2013. ^ "'2013 Results: Kansas'". Ironman.com. June 9, 2013. ^ Varley, Teresa (August 2, 2017). "Getting back to work". steelers.com. Retrieved November 21, 2017. ^ Jimison, Robert (November 9, 2017). "2018 Winter Olympics: What you need to know". CNN. Retrieved December 7, 2017. 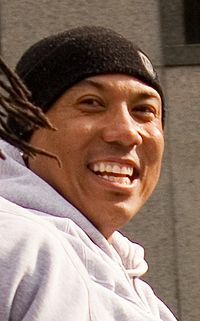 Wikimedia Commons has media related to Hines Ward.